It may not be a new feature or mode for Madden NFL 16 that lifts potential enjoyment of the game the most but rather the effect of rules change. Today at the NFL owner’s meeting a new rule was passed related to the most boring play in football – that being the point after touchdown. Not only will it greatly benefit NFL games but the video game that represents the league will also become more fun due to the ramifications of the change. The new procedure allows for the choice between kicking a 32 yard extra point or going for two from the same two yard line as in the past. In recent seasons over 99% of extra points were successful and in Madden that percentage would be even higher. The only way to miss an extra point has been to do so on purpose, and there’s no chance of them being blocked or botched due to a bad snap unlike real life as rare as those occasions happen to be. 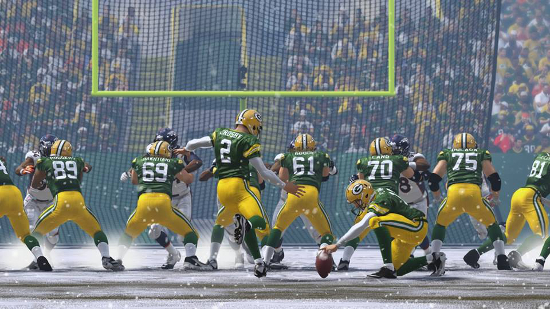 The extra point has been maybe the biggest time-waster in Madden and now that should no longer be the case. In the NFL kickers have been making 32 yard field goals at a 91% clip. That may not be reflected properly in Madden, where that range would be closer to 100%, so hopefully some adjustments will be made to make it slightly more challenging. Otherwise the extra point attempt would still be practically automatic and do little to encourage two-point attempts. The other element to this is the defense now will have an opportunity to score on the play like in college. A turnover returned the distance will grant the team two points of their own. If represented properly in Madden NFL 16 the new rule will provide additional opportunity for coaching strategy and ramp up the drama. It won’t be “cheesing” to go for two often or after every TD and there will no longer be several instances every game where Madden would have been better off just granting an automatic point rather than making people play it out.